The mystery of Tabby's Star finally solved? – AiPT! The mystery of Tabby's Star finally solved? 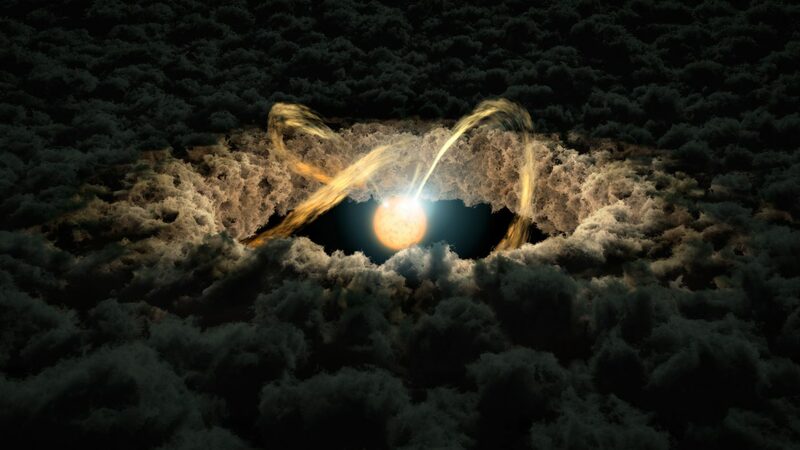 This illustration shows a star surrounded by a protoplanetary disk. The mystery of Tabby’s Star finally solved? Few celestial bodies have ignited the imaginations of both scientists and citizens the way KIC 8462852 has. Known colloquially as “Tabby’s Star” (after the lead author of the 2015 paper that first discussed its weird behavior, Tabetha Boyajian), the possible explanations for its irregularly dimming brightness have been wild and fantastic. But we may have finally figured it out. In March of 2009, NASA launched the Kepler Space Observatory into orbit to search for Earth-sized planets circling other stars, specifically ones in a Goldilocks Zone similar to ours. Its job was to monitor the brightness of over 145,000 stars in our galaxy and to send the data back to Earth, where sophisticated computers look for any anomalies. A few professors at Yale proposed that the computers might not be sensitive enough to catch every tiny difference in the data. Despite great skepticism in the usefulness of the project, Planet Hunters was born, giving thousands of everyday citizens the opportunity to review the information coming from Kepler. Lo and behold, it was some of the citizen scientists that discovered the crazy anomalies coming from KIC 8462852. To put it in perspective, a planet the size of Jupiter (the largest planet in our solar system) would diminish the brightness of a star as recorded by Kepler by only a mere 1%. It was discovered that the dips in what is called the light curve (the amount of measurable light coming from a star) for Tabby’s Star were as great as 20%. If it were a planetary body moving in front of the star, that planet would have to be HUGE to block that much light. Additionally, the dips in the light curve were asymmetrical, meaning that the body or bodies moving in front of the star did not appear to be round, as one would expect from a planet. What could possibly be orbiting a star that is not only humongous, but irregularly shaped? The scientists were further astounded that the dips did not occur periodically, as would be expected of a normal orbital object, and they were of extremely varied durations, lasting from hours to a couple days to over a week at a time. The hypotheses have ranged from interplanetary collisions to straight-up Star Wars-esque galactic battles. According to Tabetha Boyajian from her TED talk back in 2016, the first idea about this funny star was that it was just a baby, still coalescing in its infancy, which could account for the variations in the recorded brightness. This idea, along with others like an interplanetary collision, was quickly discarded, as none of the accompanying heat and debris normally associated with such an event were present. What a Dyson Sphere might look like. Then an idea took the world by storm. What if the seemingly random variations in brightness could be caused by the presence of a giant alien superstructure? Something so massive as to encompass the entirety of the star, but at a safe distance to avoid combusting from the incredible radiating heat energy. We can imagine an alien race living in the habitable zone of Tabby’s Star, one that’s depleted all the energy resources on their planet. Does that sound familiar? They could potentially build a system of solar panels called a Dyson sphere around the star to harness its energy, solving their crisis. A representation of just how huge a Dyson Sphere would have to be. To construct a device of this magnitude, however, is beyond our comprehension. Even an unenclosed Dyson “swarm” would require technologies so far beyond our capabilities that they are currently better left to our imaginations. Carl Sagan once famously said, “Extraordinary claims require extraordinary evidence,” and so this hypothesis is better left to the side until more likely alternatives are ruled out. Those aliens are on their own! Boyajian’s personal favorite proposed hypothesis was the possibility that we had experienced, in our own solar system, a real intergalactic space battle and the catastrophic destruction of a planet. “I admit that this would produce a lot of dust, that we simply don’t observe. But if we’re already invoking aliens in this example, who’s to say they didn’t just clean up all the mess for recycling purposes. You can see how this quickly captures your imagination.” she said to a chuckling audience at her 2016 TED talk. While the galactic, planet-exploding battle and the existence of Dyson structures are at this point, let’s say, “highly unlikely,” there is still the possibility of KIC 8462852 being a massive planet-eater. As recently as January of this year, scientists proposed that the star has in its orbit a super planet whose gravity could propel smaller planets and debris into the star, thus causing the planet’s light to waver erratically as it consumes the energy of unlucky celestial wayfarers. Galactus and Unicron enjoying a meal. In October, a new study was released by NASA based on the combined findings of the Spitzer and Swift missions suggesting that, to the chagrin of many excited about previously proposed options, the cause for all the fuss surrounding KIC 8462852 is … wait for it … dust. Yes, good old-fashioned dust. Not like the dust you find under your bed or clogging your consoles, but particles large enough to stay in orbit around the star without being forced into space by the star’s gravity. “The new study suggests the objects causing the long-period dimming of Tabby’s Star can be no more than a few micrometers in diameter (about one ten-thousandth of an inch),” according to the article posted on NASA’s website. Don’t be sad, though. Even NASA admits that while this is the best scenario they’ve been able to construct thus far, as with the planet-eater hypothesis, it is by no means the final word on what is really happening with Tabby’s Star. With the world fired up and watching, studies will continue until we have the technology to confirm exactly what is going on out there. Until then, keep following the updates and perhaps join the Planet Hunters yourself. Maybe the next anomaly will be found by you!